In other words, thank God in these troubled times for the zombie film, which ever since 1932’s White Zombie, a movie which is as racist as it sounds, has been working to heal a nation’s wounds by tearing it apart with its teeth. In 1968, as the nation reeled from the assassination of Martin Luther King and Robert F. Kennedy, and North Vietnam launched the Tet Offensive, theaters full of horror-hounds were treated to the nauseating catharsis of seeing the recent dead chew through their fellow Americans. And the hero of the movie was African American. Since then, zombies have fought tooth and nail for their share of the pop culture sphere, and achieved ubiquity, their own form of the American dream. Every year thousands march in “zombie walks,” while millions tune in to The Walking Dead, Fear the Walking Dead, Z Nation, iZombie, In the Flesh, and more. They’ve entirely supplanted the more elitist monsters who we used to turn to for scares — your Eurotrash Draculas and their vampire ilk, your werewolves and wolfmen, your Frankensteins, which were really just zombies with bolts in their heads. 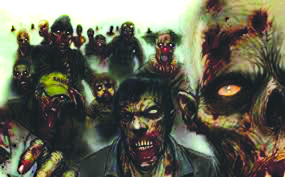 I’m sure I’m not the first to ask, but nevertheless: are zombies the most populist monster of all, or the least? Ah shucks, I’m rambling again. Here’s what’s important. Movie Lovers has your zombie needs covered. From Lucio Fulci’s eye-popping (literally) tropical zombie cheapie Zombi to Pontypool, the terrific, thrifty adaptation of Tony Burgess’ hallucinatory Canadian novel, we’ve got what you need and we’ve got it in spades. Spades full of grave dirt and guts. Happy Halloween!